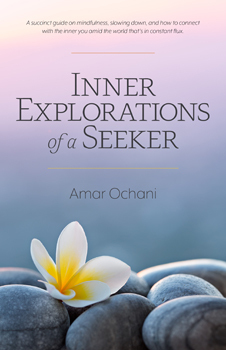 A collection of essays and thoughts on self-improvement and spiritual growth, the Inner Explorations of a Seeker aims to illuminate your path with a nurturing light as you embark on an inner quest. Among these pages are musings on finding one's passion, understanding the true meaning of compassion, why must one meditate, learning to be mindful, practicing loving kindness and forgiveness, building satisfying relationships, developing a balanced parenting approach and other subjects that we'd like to comprehend but often struggle with. Also, interspersed throughout the book are insightful thoughts on themes such as awareness, gratitude, generosity, equanimity, detachment, integrity, art of living, and on. Every thought dwells on a distinct theme or looks at the same theme from a different perspective, and is complete by itself. Clear, concise and non-sectarian, Inner Explorations of a Seeker is your essential reading on everyday spirituality and a helpful resource for living an inspired life.